Tomato puri is a puri flavoured with tomatoes and mint leaves.Yesterday when I was thinking that I should prepare something new type of puri with the combination of Aamras my sight fell on Anjana ji’s recipe in the facebook page updates and I visited her blog,liked it at the first sight and I immediately prepared it without wasting time.Anjana ji’s blog Maayeka is a vegetarian blog with wonderful recipes.I have many in my list to do recipes from her blog.My daughter sanju liked this puri so much that I had to prepare it the next day too.This puri is tangy and spicy and blended well with Aaamras since Aamras is sweet.Stay tuned for Aamras,coming up next. Now add tomato puree in the wheat flour mixture and make a medium stiff dough.add few tsp of water if needed. 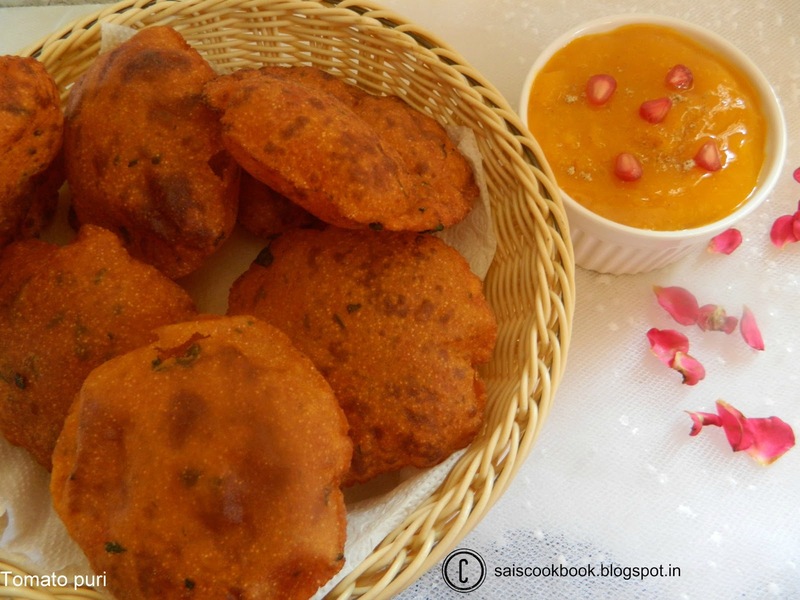 Heat oil in a deep pan and gently slide the poori in the hot oil. 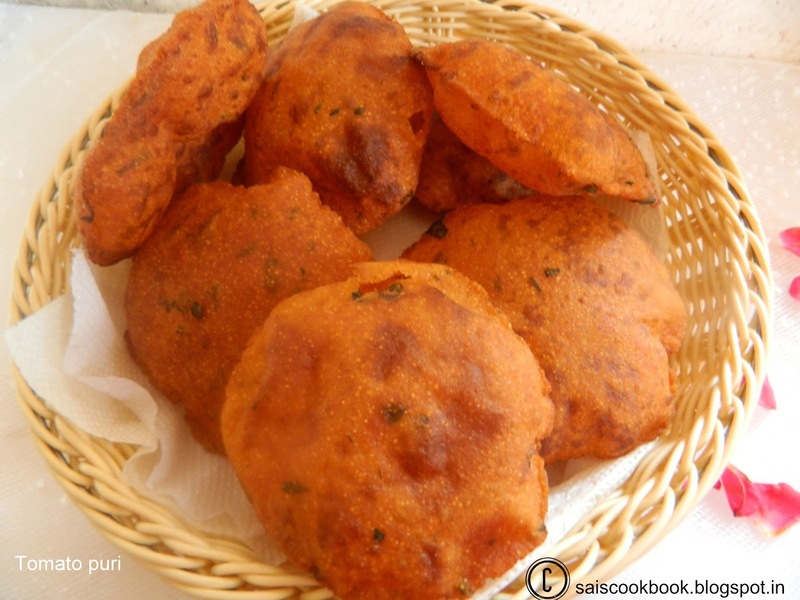 After adding in the oil ,reduce the heat to medium and gently press the poori from one side with a slotted spoon,it helpes to puff up the poori. Fry from both the sides till golden in colour,remove from the pan and drain on a paper napkin. 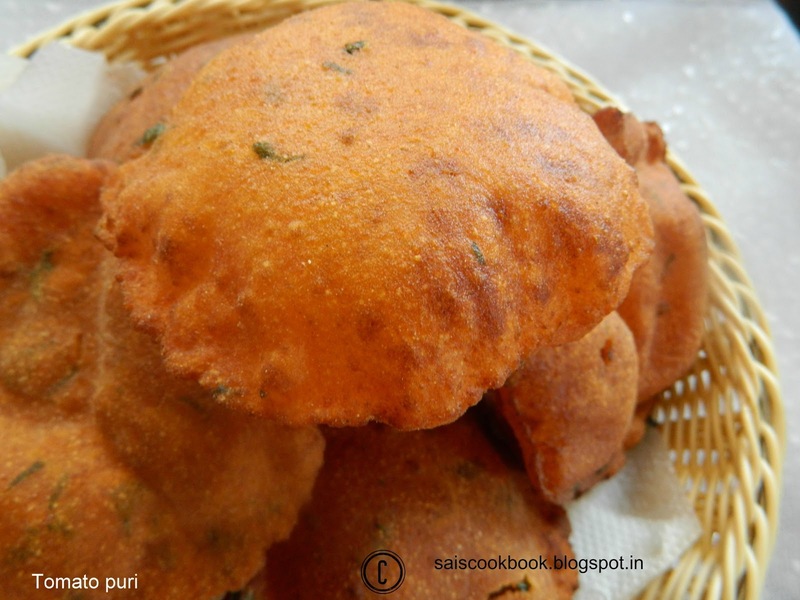 Wow Sai tomato puri’s….. I love flavor of tomato as well as mint this might have tasted Yummmmmm!!!!!!!!! !